TVS Apache RR 310S sportsbike price hiked? TVS Motors seems to have already hiked prices of the Apache RR 310S, which was launched in India just a month ago. The on-road price of this sportsbike has increased by Rs. 3,600, from Rs. 2.34 lakhs on-road in Hyderabad. The new price revealed by a TVS dealer in Hyderabad is Rs. 2,37,600. There is no indication as to why the prices of the Apache RR 310S have been increased so quickly. The bike’s launch price was Rs. 2.05 lakhs, and deliveries were to commence from the end of December 2017. TVS is selling the bike across India, and will increase deliveries in a phased manner. The Apache RR 310S is not just the most expensive bike TVS Motors has ever sold in India, but also the fastest, with a top speed in excess of 160 Kph. The bike is powered by a 310cc, single cylinder engine that has been developed by BMW Motorrad. This engine features a unique reverse inclined design that has allowed the chassis designers of TVS Motors to keep the weight of the bike centralized. This allows for better handling. The engine, which gets fuel injection as standard, produces a peak power of 33 Bhp at 9,700 rpm and a peak torque of 27.3 Nm at 7,700 rpm. A 6 speed manual gearbox is standard. 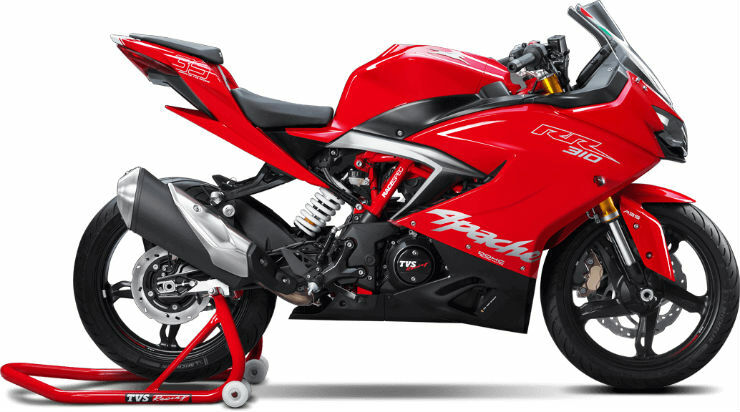 The Apache RR 310S features a trellis frame that TVS Motors has developed on the racetrack. It gets Kayaba tuned front and rear suspension. The front suspension consists of upside down forks while the rear features a monoshock that is adjustable for preload. The sportsbike weighs 169 kilograms, and gets a ground clearance of 180 mm. TVS Motors offers it in two colours – glossy red and matte black. The Apache RR 310S is meant to be an everyday motorcycle, meant to be at ease both on the road and the racetrack.